You've had some money problems, and the major credit card companies keep turning you down. You're about ready to give up until one day, a letter arrives from a company promising you a Gold card. No credit check is required, you're already approved. All you have to do is pay 49 bucks. There's a small picture of a VISA card right on the letter, and you can't resist, so you call the number on the ad and pay the fee. Two weeks later, the card arrives along with a catalog. The card is gold all right, but it's not a VISA. It's a card for purchasing over-priced products in the catalog. Not only is the card worthless, you're out money you couldn't afford to lose. 1. Be Suspicious of Pre-approvals. If you've had credit problems, be suspicious of offers that say you're pre-approved and no credit check is required. Major credit card companies don't operate this way. Scammers target people with poor credit, knowing they're more likely to accept offers. If you're not sure about the company, contact your local Better Business Bureau, U.S. Postal Inspection Service, or State Attorney General's office to see if the outfit is under investigation. 2. Do Not Pay Upfront Fees. Don't pay a big fee upfront to get a credit card. Credit card offers from legitimate card issuers do not charge upfront fees. There may be an annual fee for the card, but that is included on your first statement. 3. Look into Secured Card Benefits. Get a secured credit card from a bank if major card issuers turn you down. 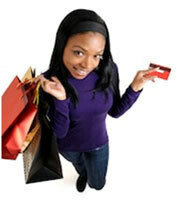 Secured credit cards are a sound way to begin establishing good credit. You deposit money into an account, and the credit limit on the card equals your deposit. The money in the account is still yours--it's not a fee for the card. 4. Protect Your Personal Information. Never give out your bank account or debit card number to a telemarketer, including one who's offering you a credit card. 5. Know the Details of a Legitimate Application. Learn about the credit card application process to help distinguish between phony and legitimate card offers. 0 Responses to "Credit Card Offers That Are Too Good To Be True"